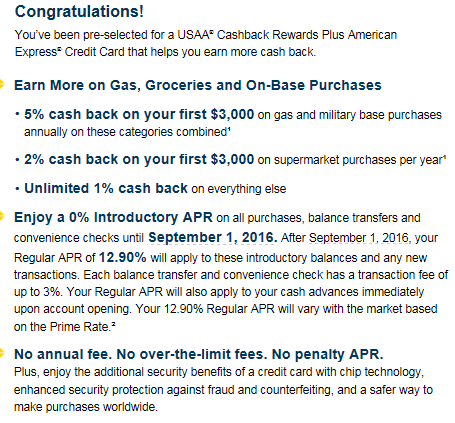 Well this is tough, I think if you shop a lot on base you get more out of the USAA, but if you spend more than $3,000 a year then the Amex Blue Cash Preferred will give you more cash back up to $6k. However I personally value points more than cash back, so I put up the Everyday Preferred points assuming you meet the 30 transactions per week. Assuming you are getting 2 cents per point you could potentially get 9% on groceries and 6% on gas in the form of hotel stays or airplane tickets with the Everyday Preferred. Hope that clarifies your options.